Use it for quick, accurate readings during stovetop cooking, or after food has been removed from conventional or microwave ovens. The exclusive, adjustable stainless steel clip makes it easy to mount on the sides of pots. Tala Jam Syrup Suger confectionery Candy. With clear markings for sterilising, jam and confectionery. Things hotting up?. Stainless steel case with heat-resistant handle, waterproof construction and glass tube. Made with good stainless steel. The Thermo Spatula is a handy tool for chefs and culinary enthusiasts alike, it allows you to monitor the temperature while stirring recipes. The short design allows the probe and clamp to stay out of the way of stirring unlike others that are tall with long arms which get in the way. The Thermo-Clamp is made of the highest quality solid 6061-T6511 Aluminum for strength and durability so it can be passed down from generation to generation. 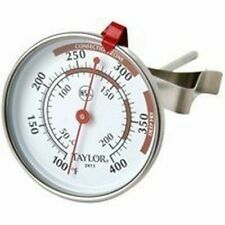 New ListingTaylor Candy & Deep Fry Thermometer Stainless Steel Mod. 3511-21 New in Package! 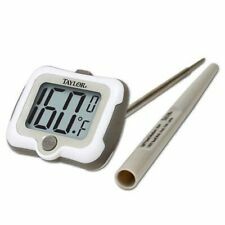 Taylor Candy & Deep Fry Thermometer Stainless Steel Mod. 3511-21 New in Package! Condition is New. Shipped with USPS First Class Package. Model: TCG400. Specialized for candy making and deep frying. Color-coded scale with target range. Display Size 8"/20.3 cm color-coded scale. column in stainless steel housing. Bulb wrapped for extra safety. Adjustable Sliding Pan Clip. Adjustable Readout pivots for easy viewing at multiple angles. Auto Shut Off preserves the battery. Accidentally receive the wrong item?. Problem with your order?. We are not satisfied unless you are satisfied. 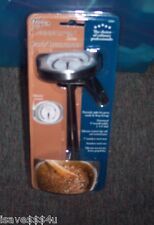 MAINSTAYS CANDY & DEEP FRYER THERMOMETER NEW IN PACKAGE. Condition is New. Shipped with USPS First Class Package. Insulated handle. Stainless steel design. Temperature range 40 to 130F Durable laboratory glass Comes with a protective case for storage Temperature guide included on sheath Please note, customs and duty taxes are the responsibility of the consignee and are not included in the shipping cost. Probe length approx 147mm (not including display). Sturdy, stainless steel probe. It is also very easy to operate. Deep Fat Fryers. Hot Drinks. Babys Milk. Four button digital display. Ideal for use with. 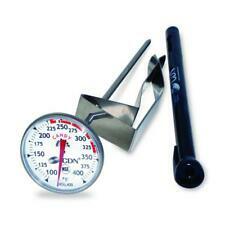 TRUTEMP by Taylor CANDY-DEEP FRY THERMOMETER - MPN 3510 NIP !!! Insulated pan clip and safety cap. Large easy to read numbers. NEW Genuine Le Creuset. Large Easy To Read Dial. 100 to 500 F.
VTG ACU-RITE DEEP FRYING CANDY JELLY THERMOMETER 712 JOHN CHANEY INSTRUMENT NIP. Package has some damage but it’s sealed Shipped with USPS First Class Package. The Taylor 513 features soft grip handle and handy temperature chart printed on the spatula. Manufacturer Taylor. Manufacturer Part Number 513. Keep chocolate at right temperature. Professional Scales. Includes protective sheath with oil and candy temperature guide for quick reference. 10-year limited warranty. It's more than accurate, it's AcuRite. • Includes Oil & Candy Temperature Reference Guide. 100° - 400°F temperature range. Tundra was started in Boulder, Colorado in 1993 – over 20 years ago. It's very important to us that you are happy with your order. Under no circumstances can we take back an item that has been used. 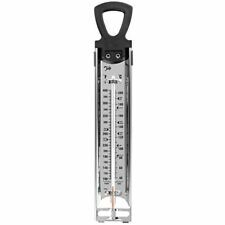 CDN's Candy and Deep Fry Ruler Thermometer (TCG400) is designed to help you make superior candy, jelly, and deep-fried foods. Constructed of durable laboratory glass with non-mercuric column in stainless steel housing, with a stay-cool handle. The eight-inch (8 inches / 20.3 centimeters) color-coded scale has a temperature range of 100℉ to 400℉ (40℃ to 200℃). 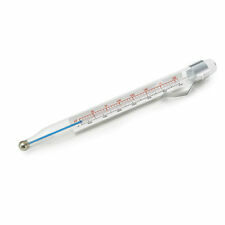 For added convenience this thermometer features two-way mounting via hook or stainless-steel clip. Model: TCG400. There is an adjustable stainless steel clip which fastens to the pot you are cooking in, white the food-safe plastic sheath has a pocket clip to accommodate the busy lifestyle of the modern cook. For candy & high-temperature cooking. Paint And Paint Supplies. Stainless steel construction. Adjustable clip for attaching to the side of the pan. Temperature ranges from 100� to 400� F. Notions And Miscellaneous. Chocolate Thermometer By Taylor Mfrpartno 513. Condition is New. Shipped with USPS First Class Package. LARGE EASY TO READ TEMPERATURE ZONES. DISHWASHER SAFE. Face shows proper candy temperatures, from thread to hard-crack. With a distinctive new look,this series clings to all things culinary. This line features full stainless steel cases designed with unique shaped oversized dials for ease of reading. Caution: Do not use in a conventional or mircowave oven. 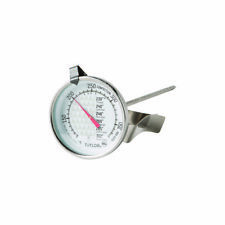 Care and use: read the temperature with the thermometer immersed to the 'liquid level' mark. To avoid possible damage to this instrument do not put straight into hot liquids, rather allow it to warm up in the pan. After use allow the thermometer to cool slowly on a dry surface before hand washing in warm water. Do not use this thermometer in the oven. The Elite Series features elegant, sleek designs with easy to read dials. Taylor accuracy based on 250 year tradition of accuracy in our Taylor and Salter lines. Manufacturer Taylor. Manufacturer Part Number 609.